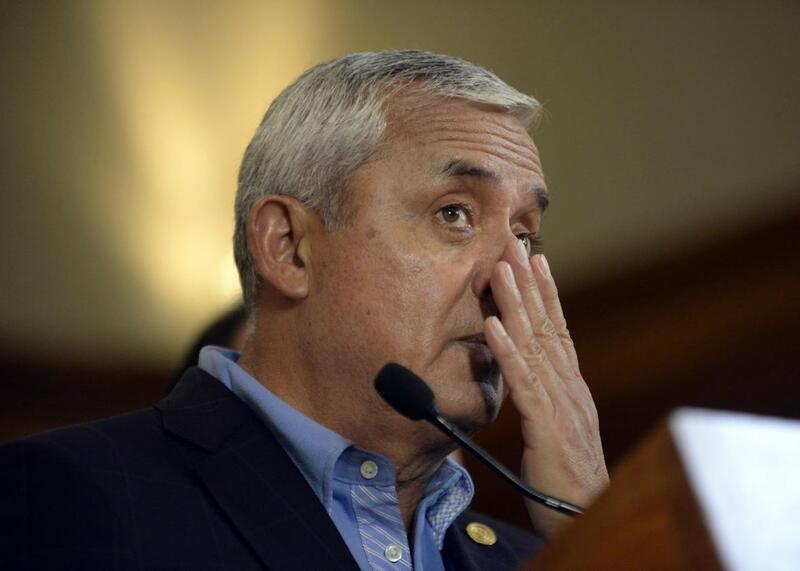 Otto Pérez Molina resigns: Guatemalan president stripped of immunity, ordered arrested over corruption allegations. Guatemalan President Otto Pérez Molina, pictured taking questions from reporters on April 17, 2015, resigned late Wednesday. Guatemalan President Otto Pérez Molina resigned at midnight Wednesday after he was stripped of his presidential immunity by lawmakers and a warrant was issued for his arrest on corruption charges. Attorney General Thelma Aldana told CNN en Español that Pérez Molina has been ordered not to leave the country, and while his attorney says he “has not run away, has not hidden, will not flee and will not seek asylum,” local media reports say his current whereabouts are unknown. Pérez Molina is accused of heading up a massive bribery operation that investigators dubbed La Linea (“The Line”). Companies importing goods into Guatemala allegedly bribed officials in order to avoid paying customs duties in a scheme that is said to have deprived the country of millions of dollars in revenue. The investigation, a cooperative venture between Guatemalan authorities and a United Nations-sponsored body known as the International Commission Against Impunity in Guatemala, already led to the resignation in May of Pérez Molina’s vice president, Roxana Baldetti, who was arrested last week. Baldetti’s replacement as vice president, Alejandro Maldonado, is now expected to assume leadership of the country after only about four months in the No. 2 slot. Technically, Pérez Molina is still in charge until the national congress formally accepts his resignation, but given the results of Tuesday’s vote to strip him of immunity from prosecution—132–0 among the members who were present—they seem inclined to let him quit. 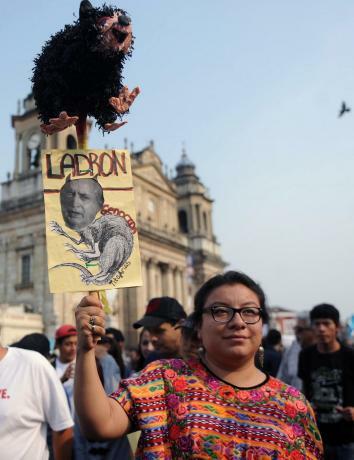 A woman participates in a protest against Guatemalan President Otto Pérez Molina and Vice President Roxana Baldetti in Guatemala City on April 25, 2015. It remains to be seen what effect Pérez Molina’s resignation—and possible pending arrest—will have on Sunday’s general election in Guatemala. Pérez Molina is barred by the country’s constitution from running for consecutive terms, but the conservative “Patriot Party” he founded in 2001 has endorsed Mario David García Velásquez, a lawyer in his late 60s who hosts a political radio show called Hablando Claro (“Straight Talk”). Guatemalans have been calling for resignations and for the prosecution of those involved in the bribery scandal, including Pérez Molina and Baldetti, with months of street protests that began with young people organizing through social media but grew into “an unprecedented mass mobilization cutting across socio-economic, political, even class lines,” the Guardian reported in June.